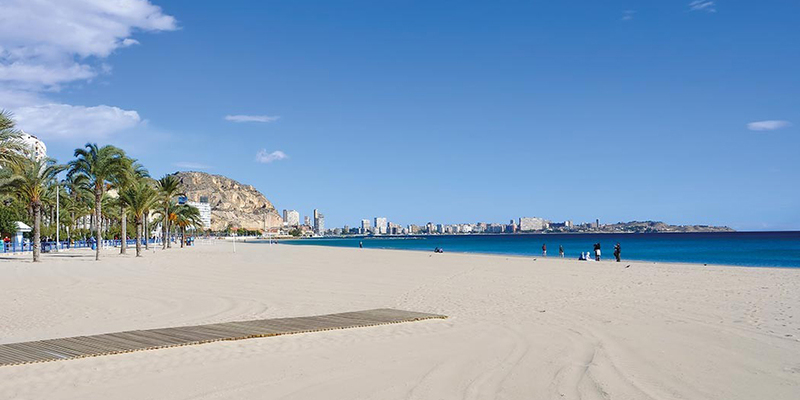 With its year-round sunshine, warm temperatures and sandy beaches, why not consider Camping in Benidorm for your next holiday. Benidorm has something to offer every type of holiday maker. Over the years, Benidorm has changed from a sleepy fishing village into today’s lively holiday destination. 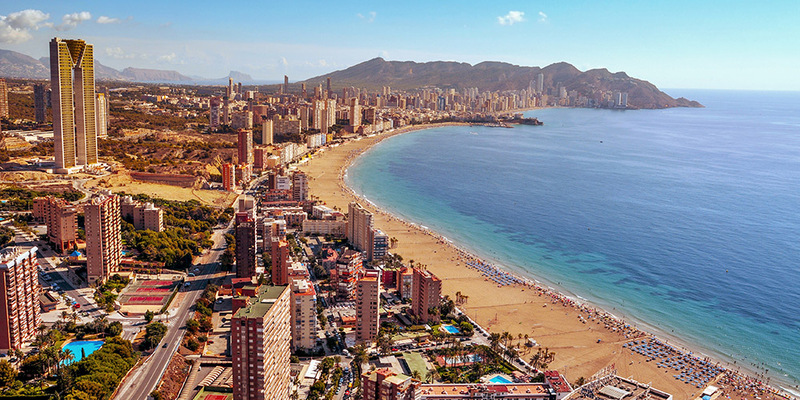 The miles of golden beach is only one of the main reasons Benidorm is so popular with tourists. Sun-worshipping aside, there are plenty of attractions for all in this sun filled Spanish city. Start by exploring the old town, with its cool narrow streets “ramblas” and whitewashed houses. Stop for a bite to eat in ‘Tapas Alley’ or wonder up to the ruined castle for beautiful views of the coast. Then, for adrenaline seekers, head to the popular Aqualandia Water Park and the Terre Mitica theme park for some action-packed fun. Even the night owls among us are catered for as Benidorm nightclubs are well known for their lively evenings lasting into the early hours of the morning. With all the opportunities Benidorm camping has to offer, you’ll wonder where to start! 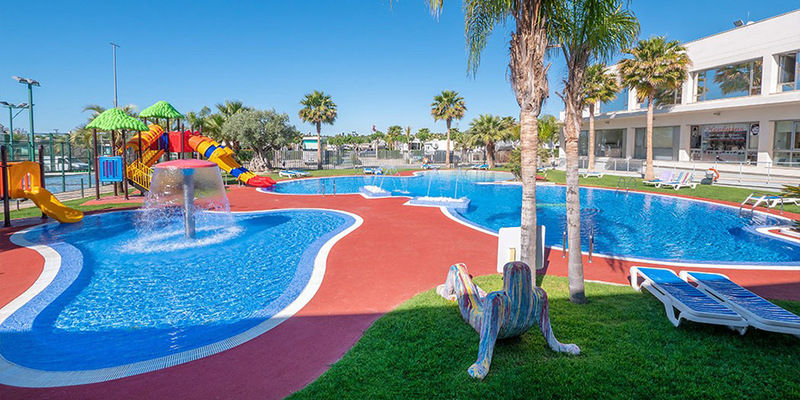 We offer lots of options when Camping in Spain with Benidorm being one of our popular campsites due to its gorgeous weather and picturesque sandy beaches. There’s lots to explore in and around Benidorm: Panoramic views reward those who climb into the surrounding Canfali hills; scuba diving in the nearby rocky coves gives those who like the underwater world plenty to see; feast on tapas and sample local Sangria while watching the sun go down; take a day trip to the Algar Waterfalls with their pools and cascades just north of Benidorm; go see all the animals in the Rio Safari Elche Zoo, with sea lions, tigers and giraffes. From taking in the sights of the old town, to partying the night away in one of the Benidorms nightclubs, this Spanish coastal destination has it all. Check out our selection of Benidorm campsites and start planning your holiday to Spain today. Currently we have one fantastic option when camping in Benidorm situated just a few miles from the long golden sand beaches, Camping Almafra. Camping Almafra campsite is set in Alfaz de Pi, and offers holiday makers the perfect resort in a relaxed environment full of amenities and activities to keep the whole family entertained with: lots of sport and hobby activities from an onsite gym to our games room; nearby horse riding and nightclub; an onsite children’s club; and if all you want to do is top up your tan then relax by our pool. Want help choosing your perfect campsite in Benidorm? Call our knowledgeable customer advice team on 0345 268 0827, or go straight to our campsite pages below. Old Town district - Located around the city centre and next to the coastline, this area is full of shops and galleries, great for picking up local gifts and souvenirs to take home. Take your time to meander down the cobbled streets and stop at one of the numerous outdoor eating spots on the pavements and plazas. The old town is a great escape from the busy promenade, and a chance to take in the Spanish culture and history. 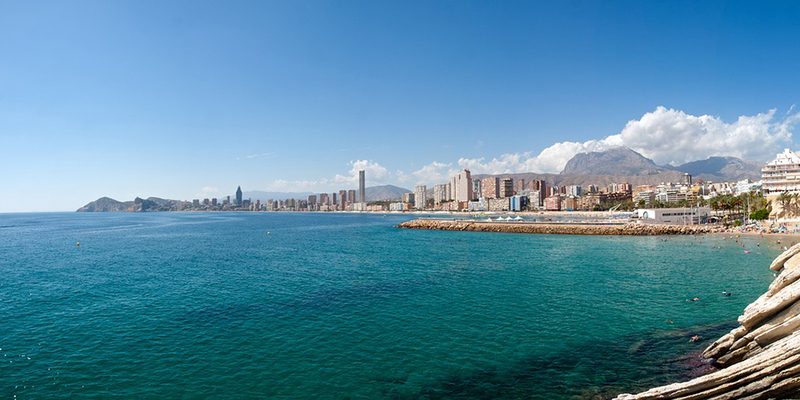 Poniente district - Poniente is a quieter area with few beach bars and fewer hotels than the other areas. Despite this, there are still lots to do along the pristine beach, including facilities to hire windsurfing boards. Or you can simply sit back and enjoy the sunset views while you relax. Levante district - If you are looking for high energy, lots of activities, and entertainment, then the Levante district is for you. Here you’ll find the highest concentration of hotels, bars and clubs in the area. It is also home to one of Europe’s best beaches, Playa Levante, stretching around two kilometers. Get down early and hire a bed and parasol, or jump in the sea with one of the numerous water sport activities available. Rincón de Loix district - Joining onto Levante is the newer Rincón de Loix district. Here you’ll find more entertainment options including the Benidorm Palace hosting spectacular shows full of Hispanic charm well worth visiting. The beach offers plenty of water sport activities including the unique Cable water ski. Or take a look under the water with some excellent diving opportunities.